What are the pros and cons of NetSuite ERP? In this article, we will take an in-depth look at the system to help you determine if it is right for you. NetSuite ERP is one of the most trusted enterprise players in the field, no small thanks to Oracle’s aggressive expansion both in features and market reach. For one NetSuite ERP features continue to evolve to provide users with so much more than accounting functionalities. It continues to offer a complete line of applications that are designed to automate and streamline business processes, boost information access, and improve customer journey. Just this last quarter, Oracle announced the latest improvements to the NetSuite platform: new themes, which are basically customized modules that are designed to boost customer engagement and conversion and support both B2B and B2C sites in targeted sectors. Likewise, new tools are rolled out to help companies adapt to customer experience management strategies, mobile optimization and personalized online shopping, along with changes in taxation and privacy rules, particularly in EU. Meanwhile, NetSuite continues to gain traction in Asia by supporting small businesses with big plans. NetSuite general manager for Asia Ronen Naishten, in an interview with Computer Weekly, said many organizations’ shift to cloud technology has been contributing to the positive outlook on technologies like NetSuite ERP. Given these positive developments, it is easy to say NetSuite will most likely work for you. However, the best way to find this out is to strip the system down to its parts for a comprehensive look. You can also do some testing on your own as NetSuite offers a great free demo, which lets you see all the key features in action first. You can easily sign up for NetSuite ERP free demo here. 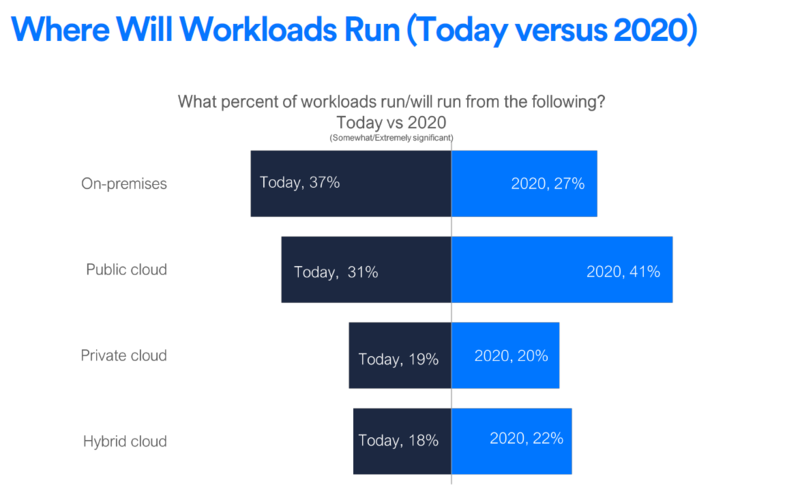 This Forbes’ analysis agrees with the outlook of General Manager for Asia Ronen Naishten on the rosy future of NetSuite, a cloud ERP. What is NetSuite ERP Software? NetSuite ERP is a comprehensive, yet highly-scalable ERP platform, designed to cater to expanding organizations and large enterprises. It is packed with all the tools and features needed to address processes such as billing, inventory, revenue, order, and financial management, along with other back office tasks. Large organizations stand to benefit most from the tool, as it gives various departments or business units a clear view of their key performance indicators, along with the organization-wide KPIs. With NetSuite, the developer has struck a balance between business intelligence and financial management, giving businesses the opportunity to make sound decisions. Its order management tools help speed up order-to-cash processes, establishing a perfect link between sales and fulfillment. Users can likewise get a full view of production workflows, greatly improving the product-to-market process. NetSuite ERP allows users to track company revenue. Furthermore, users are given the capability to manage inventory more effectively while having fulfillment data at their fingertips. What makes NetSuite even better is its ability to handle both inbound and outbound logistics and reduce total cost of ownership. Its human capital management functionalities, meanwhile, help companies optimize talent search, employee evaluation and other HR processes. Overall, business productivity can be improved, as the system can integrate different departments to work closely together inside a single platform. There is no question that NetSuite is one of the most powerful ERP software tools on the market, covering almost every aspect of your operations. Let’s discuss the pros and cons of NetSuite ERP in more detail. The benefits that if offers, functionalities and overall value will be tackled in detail, along with any weakness that the platform may possess. For those who are often left in the dark when it comes to managing their supply chains, NetSuite ERP may be a good choice. Its manufacturing, inventory and purchasing management capabilities assure increased supply chain efficiency. Clear visibility into critical supplier details, purchasing figures and inventory is provided by the system. For partners, the tool offers a self-service portal, while at the same time boosting vendor-customer relationships through better collaboration. Second on our list of NetSuite ERP pros and cons are the software’s financial modeling capabilities that can aid businesses in coming up with sound budgets and accurate forecasts. This feature helps keep organizations’ profitability while adapting to changes in their respective industries. Yearly profit targets are forecast with more accuracy, as the ERP system can analyze different financial situations that impact on the business, effectively allowing leaders to narrow the gap between forecasts and actual figures. Any business operation can be hampered by manual data entry, which is also known to cause errors in calculations. NetSuite ERP is equipped with an order and billing feature that unifies sales, fulfillment and financial operations, resulting in streamlined a workflow. Billing errors and quotations are remarkably decreased, while revenue recognition is improved. The software can also automate approval, payment and invoicing management, speeding up businesses’ order-to-cash process. Perhaps the only thing lacking in the system is its inability to support small business needs, owing to the fact that its robust feature set is designed specifically at fast-growing companies. Sales transactions and payments can be easily managed using NetSuite ERP. NetSuite’s revenue recognition management feature allows users to compute and generate accurate financial statements for just about any sales transaction, regardless when it happens. Compliance is also not a problem with the software, which takes care of everything for you. Timely financial reports can be created using the system and spare you the hassle of manual calculations. But the system does not limit itself to basic bookkeeping; it supports multiple currencies and can help users comply with international accounting standards. NetSuite ERP dashboards can be customized to cater to your organizational role or achieve that personal feel, if administrators allow it. But dashboards are not limited to their appearance; they make it simple and quick for you to examine reports and key performance indicators. 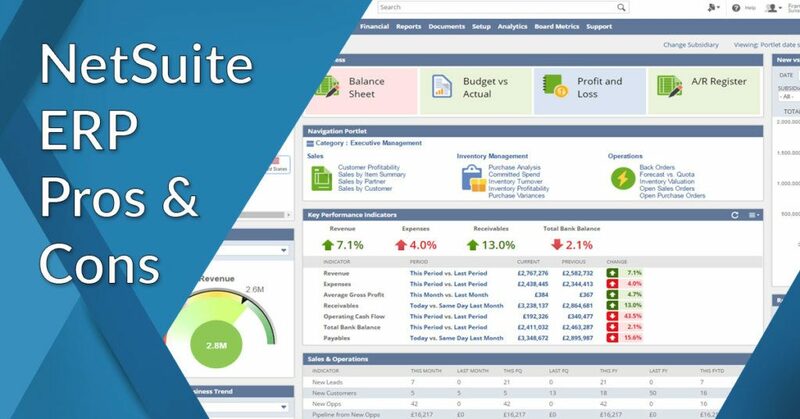 You can readily view key performance indicators from NetSuite’s dashboard. NetSuite ERP’s business intelligence module uses finance and production management information to come up with useful visual analytics and summaries that can be used for data-driven decisions. The system also helps you measure how your organization is performing in real time. The platform is likewise able to create a subscription-based revenue model for businesses by unifying both front and back office processes. Likewise, it can keep a record of customer data and transactions, which are vital ingredients in customer retention. NetSuite ERP is known as a great productivity tool, able to maximize staff productivity while reducing HR management costs. You can also scale to more sophisticated HRM features as your talent base grows. There’s hardly the need to invest in another system as your staff expands. And there you have it, our list of NetSuite ERP pros and cons. You can take your product research to the next level when you sign up for NetSuite ERP free demo here.